I keep thinking I’m going to do an update or two but time seems to pass and then I think, where did the time go? So this will be several short updates so I can get caught up. I hope all the hubby surgery illness is done for a while and then I will have a bit more time. One of the things that I have worked on is a weekly block quilt along with Beaquilter. Each Monday morning for 48 weeks she is posting the instructions for one block that will be finished as a sampler quilt. 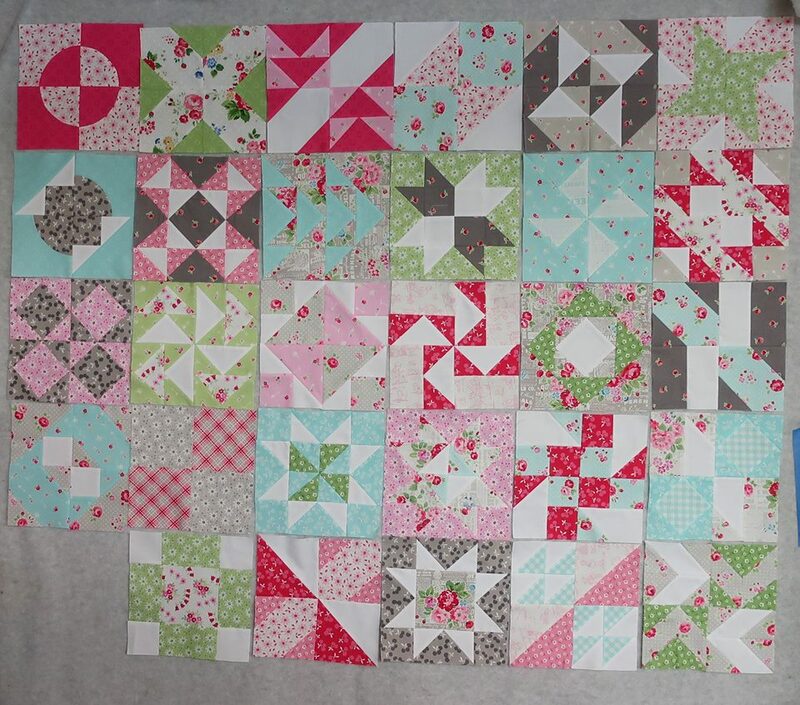 Here are the first 29 blocks that I’ve done. The fabric is from the first fat quarter bundle that I have ever purchased. For those of you that don’t know what a fat quarter bundle is, it’s a group of fabrics usually from one designer or collection that all goes together. I didn’t end up using this bundle for what I thought I was going to but wanted to use it up so here it is. I’m not sure this would have been my first choice for color or pattern but I don’t mind it and I know it will be fine when I’m all done. It’s been a fun experience for me. Although I’ve done a lot of sewing over many years, I’ve never really quilted much. I’m enjoying the challenge and learning new things including accuracy and trying to put all those pieces together in the right order without getting confused and then ending up with the correct size block. One of the things this has led to of course is fabric acquisition. Hmm like someone said, I can buy fabric faster than I can quilt. Oh well, it’s really nice to have options when I’m home sewing in the evening, need a quick gift, or just want to sew to “make” something. There seems to be always someone to give things to. I guess I’ll stop here for now. I think if I plan just several short posts for a while, I’ll get caught up with all the things that I’ve made. Not so many quilts but lots of little things.